Fritz cranks out a tune on button-box accordion during FPB's gig in Munnsville, NY on July 28, 2007 for the Stockbridge Community Fair. 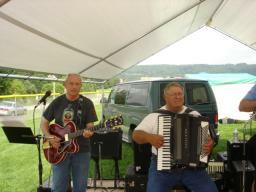 Tom and Fred are pictured here playing a tune during FPB's afternoon gig in Munnsville, NY on July 28th. 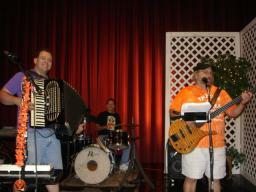 Fritz, Rick, Tom and Gabe are shown here during the second set at FPB's gig in Munnsville, NY during the afternoon of July 28th. 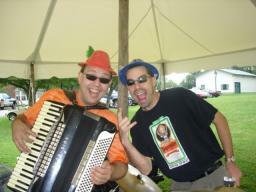 Fritz and Rick clowning around on July 28th at FPB's morning gig in Waterville, NY. Rick (wearing an Oktoberfest hat) strikes the "winning pose" in Waterville, NY on July 28th. George (in the background) and Gabe (in the foreground) are shown here cranking through a tune during FPB's gig at the Oneida County Fair on July 24, 2007. Frank, Fred, and Fritz are joined by FPB friend, Frank Svet (of Ohio), as Frank jammed on a few tunes with FPB on July 24th in Boonville, NY. Fritz presents Jennifer with an FPB/Jagermeister stretchy shirt on July 24, 2007 in Boonville, NY at the Oneida County Fair. 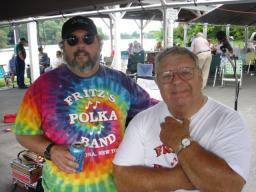 Fritz (decked out in his red shades) is pictured here during FPB's gig on July 24th in Boonville, NY. 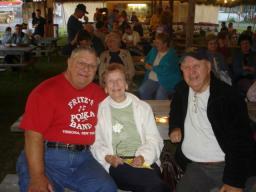 Fred is shown here with his sister, Alice and his brother, Jeff, prior to FPB's first set at the Oneida County Fair in Boonville, NY on July 24th. Gabe & Fred (two of the three founding members of FPB) relax a bit before their first set on July 22nd in Madison, NY. 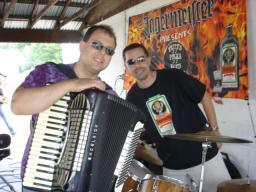 Fritz and Rick pose in front of the FPB/Jager banner on July 21st in Deposit, NY at the Lumberjack Festival. 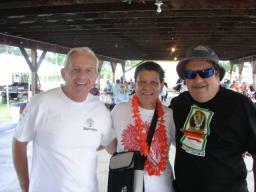 Tom is pictured here with a few Jager pals (including Tom "The Bomb") in Deposit, NY on July 21st. 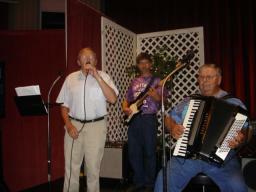 Fritz, George, and Gabe are shown here on July 19, 2007 in Oneida, NY, during FPB's gig at the Kallet Theatre. FPB Fan Club Member, Bob Zeller is pictured here with FPB Members, Frank and Fred, as Bob did yodels on Zeller's Yodel Tune on July 19th.